At Premium Christmas Wreaths, we have years of experience delivering high quality Christmas wreaths to customers all across the country. Every wreath is hand packed, carefully secured and shipped from our farm in Hartford, Michigan. And with the ability to ship anywhere within the continental United States, no customer is left behind! Whether you’re in sunny California or frigid Maine, you can have a fresh Christmas wreath delivered to your home within four days. 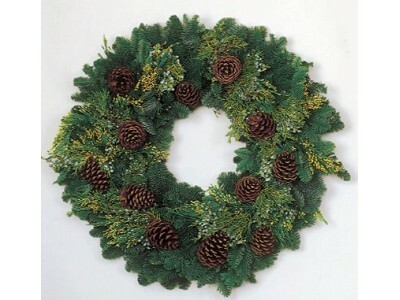 In addition to swift delivery of fresh Christmas wreaths, we offer the widest selection of handmade wreaths around. From our classic boxwood and winterberry wreath to more exotic options like our Bentley wreath, we’re confident that you won’t find another vendor capable of delivering a comparable selection in the same quality. Beyond decorative purposes, our fresh Christmas wreaths make excellent corporate gifts. Whether it’s for your favorite customers or your tireless employees, a fresh wreath is always a thoughtful, memorable present. Regardless of how many you need, our delivery terms remain the same: in 2-5 business days – depending on your location – you’ll have all of your fresh Christmas wreaths delivered and ready to be gifted. At Premium Christmas Wreaths, we pride ourselves on offering the best fresh Christmas wreaths for delivery. Every year, we create new and exciting wreaths to delight our customers and add a little Christmas spirit to their homes. If you’re just starting your Christmas planning, be sure to take a look at our online selection and let us help you bring some cheer into your home!